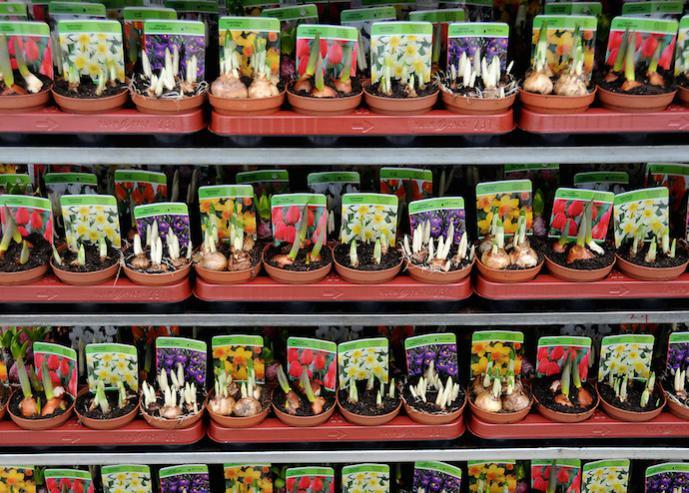 Bulbs in pots come in a large range of varieties: bluebells, hyacinths, tulips, daffodils, and many, many more. If you're finding it hard to choose, but do want to create a pleasant atmosphere in your garden, consider the following: take different types and colours of bulbs in pots, but in same-colour pots, and place them all together on a round, cheerful rug. The 'Pearl' series of hyacinths and the 'Magic' Muscari series mix particularly well. At the moment of purchase, the bulbs in pots are mature to the point of being on the verge of flowering. No further, of course, because flowering is what we want them to do in your garden. The flower buds will burst into bloom in a short time. It is quite extraordinary to see how the bulbs' roots search out water and food. Try putting a potted bulb in a glass jar for once, and you'll get to see exactly how Nature paves its own path. Muscari 'White Magic' and Scilla siberica produce wonderfully aromatic flowers. In other words, glass pots are a perfect way to entice the senses. It's nice to spoil yourself once in a while, but making someone else happy is wonderful. Bulbs in pots are perfect to give as a gift, because it is guaranteed to put a smile on the receiver's face. For instance, try giving someone irises or daffodils in a decorative little bag so that the whole can be directly placed somewhere in the garden, on a shelf or on a bench, for instance. It'll sprout into a cheerful bouquet of flowers: a little bag of joy. It's still cold outside, but there's no time like the present when it comes to brightening your garden up. In this period, too, Bulbs in pots offer all kinds of opportunities for garden enjoyment. 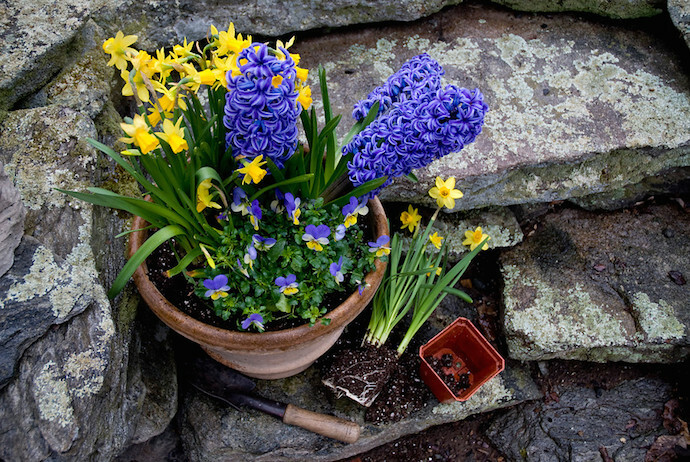 Spruce up little corners, pots and tables with, say, hyacinths, tulips and daffodils. Make sure to place the bulbs in pots in such a way that they're well visible through the window from inside the house. It'll make it all the more fun, once the sun starts to shine again, to nip into the garden to take a close look at how nature is growing and flowering into spring. 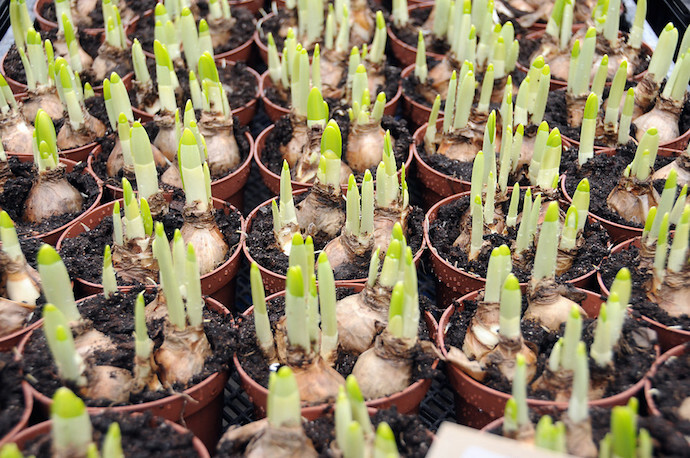 Bulbs in pots are available from December to Easter. 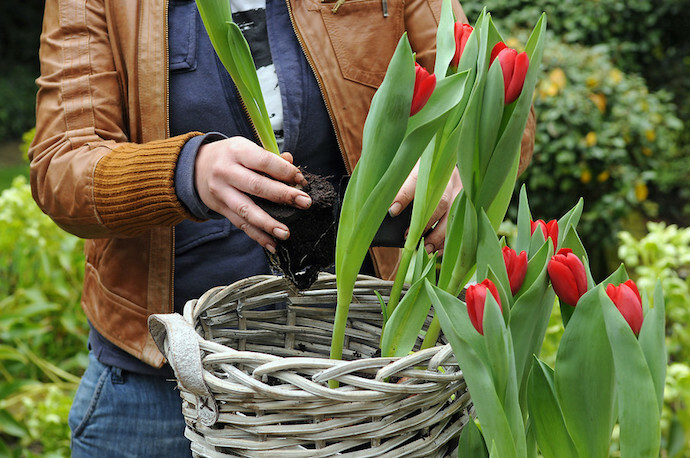 Using bulbs in pots is not difficult, and the result is instantly cheerful. Prepare a number of large pots with a few holes in the bottom. Put in a layer of pottery shards or hydro grains and fill with potting soil. Remove the plastic cultivation pots from, for instance, potted bluebells. Plant in such a way that the section that was in the cultivation pot is covered by the potting soil, while the remainder remains above ground. Before you know it, your garden will be in full bloom.